Like Tokyo's above-ground telephone poles, I stopped noticing the city's crows years ago. 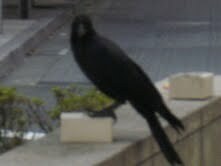 But ever since visiting friends called our attention to the intelligence of these big, black birds, I have been quietly observing and acquiring a new appreciation of them. If you read the recent issue of Time magazine whose cover story proclaimed that many animals appear to be smarter than we thought (something I have suspected for a long time), you will know that crows have many talents and are surprisingly dexterous, especially considering their physical equipment. My firsthand experience this morning further supports this finding. So there we were, in front of the 24-hour grocer, Food Magazine. Pippi was sniffing up a storm and I was stalled in an early-morning stupor having woken up only a short time ago. 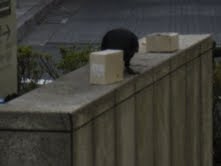 But when a sharp, staccato pecking noise interrupted my reverie, I looked up to see this crow vigorously and systematically attacking a small box with its beak. The tenacious bird appeared to be taking a two-pronged approach: poke a hole in cellophane window and/or lift open the box cover. My photos do not really do the scene justice. Would that I had gone into video mode. It was not until I approached the crow at work that the contents of the box revealed themselves: a dainty ham sandwich adorned with lettuce, tomato and mayo. This is a crow with a sophisticated palette! When we neared, the crow ascended to a tree nearby where he/she could keep an eye on the bounty. 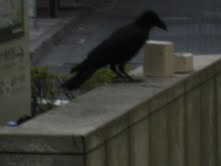 After snapping some pictures, we walked away and left the crow to finish breakfast.